Farrar, Straus and Giroux, 9780374292195, 256pp. Viking marauders descend on a much-plundered island, hoping some mayhem will shake off the winter blahs. A man is booted out of his home after his wife discovers that the print of a bare foot on the inside of his windshield doesn’t match her own. Teenage cousins, drugged by summer, meet with a reckoning in the woods. A boy runs off to the carnival after his stepfather bites him in a brawl. In the stories of Wells Tower, families fall apart and messily try to reassemble themselves. His version of America is touched with the seamy splendor of the dropout, the misfit: failed inventors, boozy dreamers, hapless fathers, wayward sons. 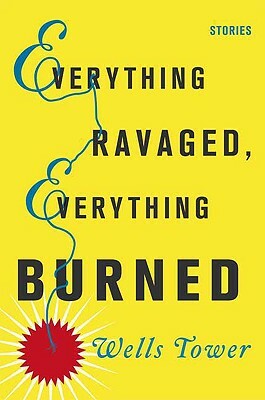 Combining electric prose with savage wit, Everything Ravaged, Everything Burned is a major debut, announcing a voice we have not heard before. Wells Tower's short stories and journalism have appeared in "The New Yorker," "Harper's Magazine," "McSweeney's," "The Paris Review," "The Anchor Book of New American Short Stories," "The""Washington Post Magazine," and elsewhere. He received two Pushcart Prizes and the Plimpton Prize from "The Paris Review." He divides his time between Chapel Hill, North Carolina and Brooklyn, New York.